Colombia’s countdown to e-voting has begun. The advisory commission for the implementation of a new electoral system cleared the way and gave the go-ahead for the country to automate the internal elections of parties and political movements scheduled for September 29. With this decision, the Registrar’s Office will undertake a task for which it has been preparing for years: modernizing Colombian voting with the aid of electoral technology. The test will consist in allowing the electorate to experiment with two models of e-voting. One of these models uses Precinct Count Optical Count (PCOS) devices. This is a procedure that automates tallying by using a ballot box with an optical scanner, which in turns verifies special ballots designed for this. The ballots are manually introduced in the machine, thus allowing for the conservation of a receipt. Then, the tallying device identifies the ballots and registers the votes, tallying them in the machine’s memory. The second option is known as the Direct-Recording Electronic (DRE) system, which consists in touchscreen devices on which voters directly mark their votes. Ballots are stored in the machine’s memory or in a storage device if used. At the end, the machine prints a vote receipt. The Registrar’s Office will be in charge of defining what types of e-voting will be used in September under these two modes. During the event, the electoral body will test out the performance of the machines and the effectiveness of the system, but it will also be able to take note of the logistic needs (infrastructure), the requirements for voter and tech personnel training, and those for scrutiny, result transmission, security, and auditability. Colombia is getting close to the automation of its elections. In 2004, the Law commanded the implementation of e-voting, but governments have stopped the adoption of technology. After next September’s test, electoral advancement will no longer depend on plans or proposals, but on the decision of the authorities to strengthen suffrage, and along with it, Democracy. A report on the development of electoral technology was recently published on “Mundo en línea” (“The World Online”), an electronic tech journal. The text addresses in detail the different voting models used nowadays, and it highlights the fact that electoral automation is undergoing its most important decade since its invention. Read the review here. 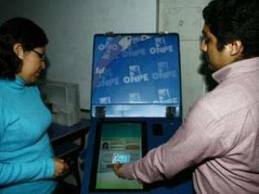 Peru’s ONPE designed a voting machine, which has been tested in three occasions. Peru is one of the Latin American countries that have strived the most to take their electoral system to the next level. Based on its experience with manual voting, the nation’s electoral needs, and the technological references other regions have in this matter, the country decided to leverage e-voting several years ago. The effort was indeed fruitful, as the Office for Electoral Processes (ONPE) worked on the design of a voting machine that was used for the first time in 2011—second round of the presidential election—in the Pacarán district of the Lima region’s Cañete province, with very effective results. This experience set the framework to repeat the process in the same locale for last September’s recall referendum. Cañete was chosen again to show the country the benefits of automated voting during the municipal election and the recall referendum held last July 8th. These were two tests that brought very significant results in terms of equipment performance, voter training, electoral guarantees, and an accurate tally. Mariano Cucho, head of ONPE, stated that the participation of the township of Cañete showed that the use of new technologies can optimize elections, not only in terms of speed—voting took only 30 seconds—but also in terms of facilitating the exercise of this political right and guaranteeing the security and transparency of results. 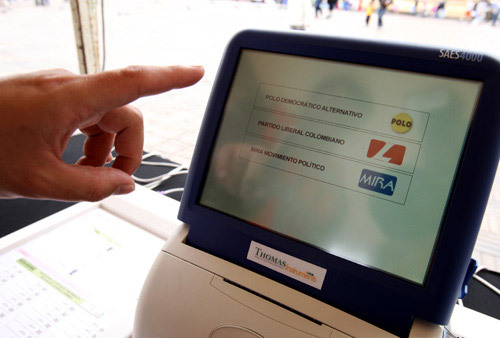 Electronic voting in Peru is based on the use of a card, which once inserted in a machine, activates the device’s options (candidates to vote for). Voters press their preferred option, the system processes and stores each vote, and finally the session is closed with the emission of a paper receipt, which works as proof of vote. This receipt is deposited in a box as a physical proof of the electronic registry. Results are transmitted, via satellite, to a computer center. ed States, Europe, and even South America, as is the case in Venezuela. The idea of the emission of a vote receipt was taken from this country, where the mechanism became popular and spread out to other regions. After this successful event, ONPE announced that the 2016 elections will be automated. The challenges it faces now are procuring the necessary resources to start the production of equipment, training the personnel involved, and carrying out an information campaign for the electorate. E-voting fulfilled Peru’s expectations, and now the authorities must fulfill the nation’s expectations too.